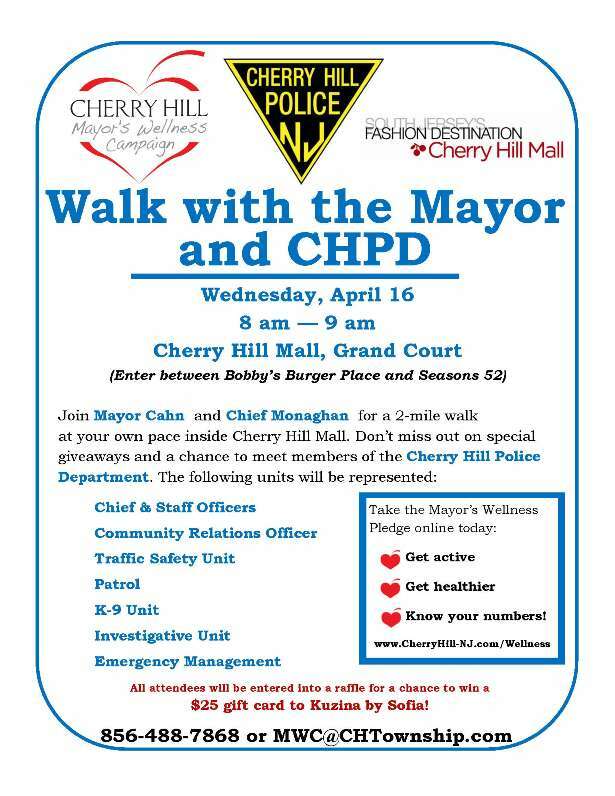 Please join me at 8 a.m. this Wednesday, April 16, as I team up with the Cherry Hill Police Department for a very special Walk with the Mayor at Cherry Hill Mall. Chief Bud Monaghan and representatives from each of the Department’s units will join us for this 2-mile walk as an early celebration of National Police Week. Don’t miss out on special giveaways, and a chance to meet the Chief, Department staff officers, and representatives from Community Relations, Traffic Safety, Patrol, the K-9 unit, the Investigative unit, and the Office of Emergency Management in a relaxed and more informal setting. All attendees will be entered into a raffle to win a $25 gift card to Kuzina by Sofia. Come out, meet the Mayor and some of Cherry Hill’s finest, and see why the New Jersey Healthcare Quality Institute has designated Cherry Hill as one of just 16 “Healthy Towns” in New Jersey for our Mayor’s Wellness Campaign! Participants should meet at the Guest Services desk in the Mall’s Grand Court, using the entrance between Bobby’s Burger Palace and Seasons 52. For more information on Walk with the Mayor or the Mayor’s Wellness Campaign, call (856) 488-7868, email MWC@chtownship.com [mailto:MWC@chtownship.com] , or visit www.CherryHill-NJ.com/wellness [http://www.cherryhill-nj.com/wellness] . The Cherry Hill Department of Engineering will continue road repairs in the Township’s Erlton South neighborhood next week as part of the 2013 Road Maintenance Program. Concrete repairs will continue for a second week on Park Drive between Cooper Avenue and Route 70, and on Grant Avenue between Route 70 and Jefferson. Both roads will be open to local traffic and emergency vehicles only during construction. Residents with questions or concerns either of these projects should contact the Department of Engineering at (856) 424-3203. Motorists are also advised that road work is scheduled on Haddonfield Road between Chapel Avenue and Church Road overnight from Sunday, April 13, through Thursday, April 17. Single-lane closures will be in place during work hours, from 7 p.m. to 6 a.m. daily. As always, drivers are asked to use caution when traveling through a work zone. In celebration of Autism Awareness Month, nearly 500 students, faculty and staff from Kingston Elementary School came together Wednesday afternoon to form a giant puzzle-piece ribbon, the symbol for autism awareness. The CDC estimates that 1 in every 68 children in the U.S. is diagnosed with autism. Wednesday's event was one of several activities scheduled during the day aimed at educating students about the theme of "How to be a Friend to Someone with Autism." The day included school-wide read-ins of "My Brother Charlie" and "Understanding Sam," discussions about Autism Spectrum Disorder, special art projects, and a school assembly. I want to thank the students and staff of Kingston Elementary for helping to promote autism awareness. Celebrate National Library Week with these special events at CHPL! Join us for traditional Japanese storytelling. Learn about Kamishibai (kah-mee-she-bye) or "paper-theater" and then we'll create our own story as a group. Open to grades 1-5. Click here to register [http://host6.evanced.info/cherryhill/evanced/eventsignup.asp?ID=5394&rts=&disptype=&ret=eventcalendar.asp&pointer=&returnToSearch=νm=0&ad=&dt=mo&mo=4/1/2014&df=calendar&EventType=ALL&Lib=&AgeGroup=ALL&LangType=0&WindowMode=&noheader=&lad=&pub=1&nopub=&pa] . Therapist, educator and life coach Diane Lang will show you how small changes can help you live a more positive and resilient lifestyle. Attendees will learn the signs and symptoms of stress and anxiety and the impact it has on your body; ways to simplify your life and live in the now; and how to feel more empowered and motivated. The workshop is free; click here to register [http://host6.evanced.info/cherryhill/evanced/eventsignup.asp?ID=5461&rts=&disptype=&ret=eventcalendar.asp&pointer=&returnToSearch=νm=0&ad=&dt=mo&mo=4/1/2014&df=calendar&EventType=ALL&Lib=&AgeGroup=ALL&LangType=0&WindowMode=&noheader=&lad=&pub=1&nopub=&pa] . Stop by the Library's lower level and browse a selection of coffee table books, art and children's books, good quality local history books and nice sets of books. Prices vary; all proceeds benefit the library. Take part in a discussion of 60 useful apps, mainly for Apple, Android and Kindle Fire devices. This event is free and open to the public; registration is not required. Last Sunday morning, Council members Susan Shin Angulo and Jim Bannar joined me in helping to celebrate the start of Cherry Hill Youth Athletic Association’s 2014 Little League season. It was a beautiful morning for the league's annual parade of players, and I had the honor of throwing out one of the season's ceremonial first pitches. Little League seasons are kicking off across the Township, and I want to wish everyone involved, across each of Cherry Hill’s Little Leagues -- the players, coaches, parents and league leadership -- a fun and successful 2014 season! At Monday night’s Township Council meeting, Council and I honored 12-year-old Cherry Hill resident Susannah Balderstone for her gymnastic achievements. Susannah, a sixth-grader at Rosa International Middle School, is a Level 8 gymnast who broke state records in both All-Around and Floor competitions in early March. Two weeks later, Susannah placed 6th overall at regionals in Doylestown, Pa., and is now ranked 25th in the country at her Level. Please join us in congratulating Susannah and her family on this tremendous achievement! The Cherry Hill Arts Advisory Board and the Department of Recreation is pleased to present “The Great Italians,” the next installment in the Township’s Ensemble Concert series, at 3 p.m. Sunday, May 4, at historic Croft Farm. Various artists from the Philadelphia Orchestra, the Ocean City Pops and the Academy of Vocal Arts will perform selections from Puccini, Luciano Pavarotti, Mario Lanza, Frank Sinatra, Dean Martin and others. Part of Art Blooms Week, this promises to be a wonderful concert. Our last event sold out; buy your tickets now to ensure you won’t miss out! Tickets are $15, with discounted pricing available for seniors and students. For tickets, visit the Recreation Department in Town Hall, call (856) 488-7868, or email Arts@chtownship.com [mailto:Arts@chtownship.com] . Click here for additional information [http://www.cherryhill-nj.com/DocumentCenter/View/2088] . For more information on the Arts Advisory Board and a full list of upcoming arts and cultural events, please visit the Arts Board blog at http://cherryhillarts.blogspot.com/ [http://cherryhillarts.blogspot.com/] . Local artists are invited to take part in the Township's Art Blooms juried art exhibit, April 26 - May 10 at the Croft Farm Arts Center, 100 Bortons Mill Road. This annual event features original two-dimensional works in watercolor, pastels, oils and more. All artwork is available for sale and neither Cherry Hill Township nor the Cherry Hill Arts Board take a commission. This exhibit is open to artists of all ages and abilities. Simply complete the prospectus [http://nj-cherryhill.civicplus.com/DocumentCenter/View/1342] and bring it along with your works of art to the Croft Farm Arts Center on Wednesday, April 23 between 4 and 7 p.m. There is a $10 per entry (maximum 3 entries) non-refundable jury consideration fee. Artwork will be juried that night and artists will be notified by Friday, April 25 if they are accepted into the show. For more information, call (856) 488-7868 or email Arts@chtownship.com [mailto:Arts@chtownship.com] . For more information on Art Blooms or other activities and events planned by the Cherry Hill Arts Advisory Board, click here [http://cherryhillarts.blogspot.com/2014/01/annual-art-blooms-juried-art-exhibit.html] . We are counting down the days until the 5th annual Art Blooms Earth Festival, set for 10 a.m. to 2 p.m. Saturday, April 26, at historic Croft Farm. More than 90 displays, vendors and activities will span the grounds at Croft Farm for this rain-or-shine event, including e-waste recycling collection, a family-friendly bike ride, entertainment, healthy food choices, and a special appearance by the Phillie Phanatic! This annual celebration of community and sustainability is hosted by Cherry Hill Township in partnership with Sustainable Cherry Hill, a 501c3 non-profit organization. Event updates are available at www.sustainablecherryhill.org [http://www.sustainablecherryhill.org/] . The festival is made possible in part by generous presenting sponsors: Hutchinson Plumbing, Heating and Cooling, LourdesCare of Cherry Hill and Ravitz Family Foundation; Leadership sponsors include: Sustainable Camden County, Investors Bank, M. Rosenblatt Roofing and Flaster Greenberg. For more Earth Festival information, contact Brenda Jorett at Brenda@brendajorett.com [mailto:Brenda@brendajorett.com] . On Monday, I joined representatives from Bob’s Discount Furniture as they presented a $30,000 donation to the Special Olympics, part of the chain’s nationwide charitable outreach efforts. The funds were collected entirely from patrons at Bob’s stores across the country, as part of their Café Collections for a Cause campaign. In the Café of each Bob’s store, customers are invited to leave donations that are collected each quarter and then given to a designated non-profit organization. Bob’s opened in Cherry Hill earlier this year, and already they are making a difference! I want to thank all those who contributed for their overwhelming generosity, and recognize the management and staff at Bob’s for their commitment to supporting worthwhile causes in the communities they serve. The Cherry Hill Fire Department will continue going door-to-door this weekend, offering residents free smoke alarm testing and installation. Firefighters will be visiting homes on Chelton Parkway, Rydal Road, Old Town Road, Old Town Circle, and Kresson Road on Saturday, and on Mansfield Boulevard North, Philellena Road, Princeton Road, and East tampa Avenue on Sunday. The list of locations is updated each week on the Department’s website [http://www.cherryhillfire.blogspot.com/2013/12/2014-smoke-alarm-campaign.html] and Facebook page [https://www.facebook.com/pages/Cherry-Hill-Fire-Department/249480684755?ref=br_tf] . Check back often to see when the CHFD will be in your neighborhood. If you are in need of a smoke alarm immediately, please call (856) 429-7441 to schedule an appointment. This week, I helped to celebrate the grand opening of the NuEar Hearing Center, a family-owned hearing health-care office owned by Cherry Hill resident Heather Loveland. I joined Heather, her husband, and the Cherry Hill Chamber of Commerce for a ceremonial ribbon-cutting on Thursday afternoon, at the hearing center’s location at 401 Cooper Landing Road. Heather began her career as a hearing consultant in 2008 and has helped hundreds of area patients in the years since. Please join me in congratulating the Lovelands on the opening of their hearing center, and in wishing them the best of luck in this new business venture! www.cherryhilleducationfoundation.com [http://www.cherryhilleducationfoundation.com/] or in the Activities Offices at Cherry Hill High School East and West. Online voting for your favorite dancing couple is also available on the Education Foundation’s website. Last weekend, Councilwoman Melinda Kane helped pay tribute to a remarkable young man, Cherry Hill resident Kyle Dixon. At just 12 years old, Kyle is already a self-published author of the children's book "Jay Bubblebee: The Bee Who Started it All." "Jay Bubblebee" is the story of a young bee who, in his father's absence, is tasked with running his family's business in order to save their home. The moral of the story is one that should be shared often with our young people: that children possess an incredible amount of strength and potential, even in the face of adversity. Kyle's ability to relay this important message to his peers at such a young age is truly inspirational, and we are proud to recognize his accomplishments. Please join me in congratulating Kyle on all he has already achieved, and in wishing him all the best in the future! Cherry Hill and Camden County have partnered to once again offer free Chair Yoga classes for Township seniors! These classes are designed to help incorporate yoga into your day, regardless of your experience level. Chair Yoga will take place in the N. John Amato Council Chambers (Room 208) at Town Hall from 1-2 p.m. on April 16, 30 and May 7. An additional date will be added in the future. For more information, call instructor Barbara “Teddy” Piotrowski at (609) 217-4018. To register, call (856) 488-7868, or email Recreation@chtownship.com [mailto:Recreation@chtownship.com] . Camden County also offers Healthy Cooking Classes, a Spring Fling Senior Dance and other events for seniors throughout the spring. Click here for the full schedule of free events [http://www.camdencounty.com/health/senior-and-disabled-services/senior-recreation-calendar?utm_source=] .